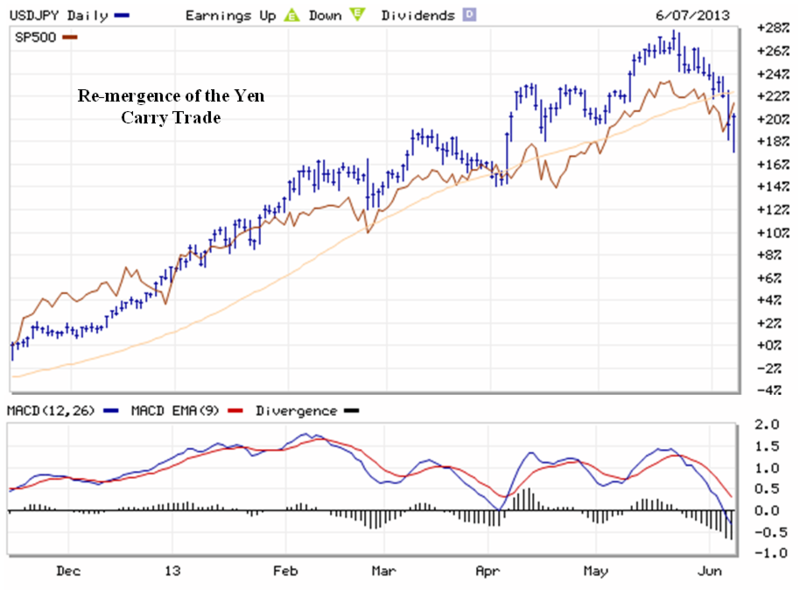 The S&P500 (SPY) started this year at 1425. 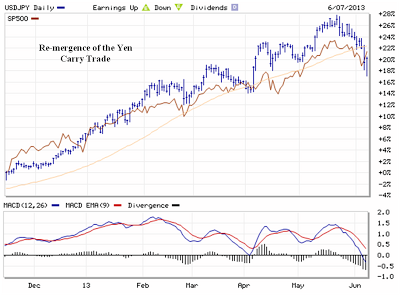 In May it reached an intra-day high of 1690, a gain of 18.5%, before pulling back to its current range. The economic fundamentals have been weak during this time period and the outlook is not cause for making a big bet on “hope”. Fourth quarter real GDP was first announced negative, and subsequently was updated to a slight positive of 1.6%. The first quarter was a similar anemic growth rate of 1.8% TTM growth. When you add in inflation the constant dollar growth rate of the U.S. economy is between 3-4%. The S&P500 rally so far this year has been supported almost entirely by the inflow of foreign money into the U.S. stock market, more specifically the Japan “carry trade”. The carry trade is a trade where an investor borrows money on a weaker currency at a very low interest rate and invests money in a currency that is expected to stay stronger and importantly, the investment will provide a higher return than the rate at which the money is borrowed. Why has the money flowed out of Japan recently? The public announcement of a major change in Japan’s monetary and fiscal policy was made on April 8th by Prime Minister Abe Shinzo. The plan involves major Japanese government bond purchases by the Japan central bank, similar to the QE policy of the U.S. Federal Reserve. The impact of such a policy in Japan is a rash of money being pushed out of government bonds (JGBs) looking for investments to buy. Any outflow of the money into foreign markets works to weaken the Japanese currency against the currency into which the dollars flow. The weakening of the JPY relative to the USD is an indicator of this directional flow of investment funds. 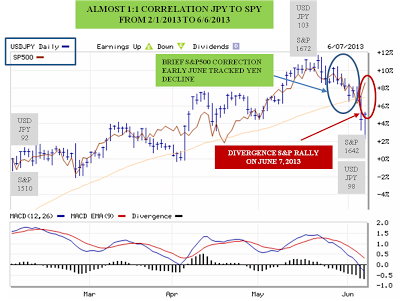 The flow of funds from Japan has probably reached a top now that the USDJPY has reached 100 and pulled back slightly over the past week (June 7). From a policy standpoint, the Japanese government has likely targeted a USDJPY level of 100 as a trade advantaged level that would be worthwhile for its own export driven economy. 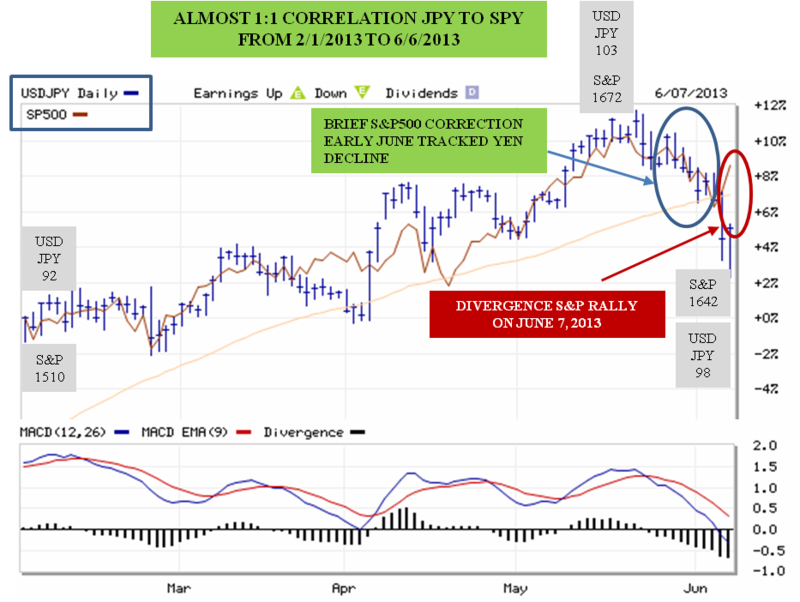 The pull-back of the S&P500 (SPY) as the USDJPY declined in early June reflected the tenuous nature of the U.S. stock market climb. The U.S. stock market decline was caught by the U.S. jobs report showing 175,000 jobs added in May, combined with continued Fed jawboning that rates in the U.S. will be going up, which continued a U.S. investor sell-off of U.S. Treasuries which flowed into the U.S. stock market. The real question that astute investors should be asking is exactly why interest rates are suddenly rising, well ahead of the Fed scale back in bond purchases, and at a time when the economic fundamentals do not predict that higher interest rates will produce sustainable economic growth (and as a corollary a continued rise in stocks). Rates are also rising at a time when the need for issuing U.S. Treasuries is declining on a relative basis due to recent U.S. tax increases and budget cuts. So what is the rush to drive rates up by the talk in the market? I pose that it is because the U.S. government has too much debt – and so does Japan. Desperate government debtor nations make rash moves when it comes time to continue to obtain financing without making major market disruptions in the process. At this point, because Japan has matched the U.S. QE policy by buying back its own debt, the flow of funds into the U.S. has created a very unstable stock market situation. It has also increased the distortion level in the pricing of risky assets, and lead to the increase of margin investment to high levels. The initial jawboning by the Fed that rates are headed up is an assault on margin investments. The Federal Reserve does not want a repeat of the 2008 scenario after finally getting the “patient” back to a stable condition. Fundamental growth in the U.S., not currency manipulation, is what is needed from this point forward for the run-up in the U.S. stock market to be sustainable. I look at the U.S. stock market as in the fair valuation zone given economic variables at about 1500 given the economic growth and prospects. From this analytical perspective, the inflow of money from outside sources is a trade that will reverse at some point because returns do not sustain the valuation. When do I believe it will reverse? – as the U.S. government raises rates to make the U.S. Treasuries and Government MBS securities priced more attractively. 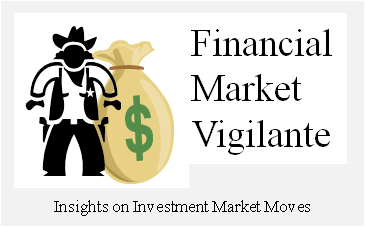 This is what the foreign money is really looking for – higher interest rate, low risk debt. This has been the staple investment of the carry-trade since the early 1990’s. The only wild card this time as the rates go up is whether Jack Lew’s statements to the press on May 10th are a real U.S. policy to keep Japanese led carry trade investment out of U.S. government debt. This will be a critical variable to watch. I keep track of the flow of funds into U.S. public debt in a chart on the Financial Calculus web-site. If you are a stock market trader, play the stock momentum game as long as the factors point to its continuation upward in conjunction with higher U.S. interest rates. It looks like a volatile trade that will continue advantaging equities over bonds for the interim period, possibly through year-end. But be careful that you are not the only one standing when the music stops playing and the foreign investors have withdrawn into U.S. government securities and the deflationary assault on U.S. working wages that is the cause of U.S. slow growth continues. If you are a long-term income investor, play the middle ground and look for good opportunities that will pay solid cash returns at relatively low duration, and start building a cash or near-cash reserve that can be shifted over time as the magic cross-over point where bonds are better than stocks is reached.